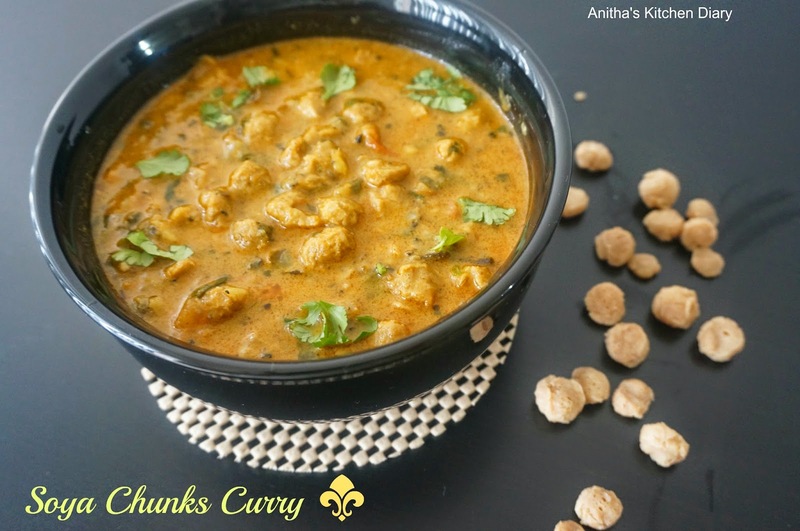 Soya chunks has lot of health benefits it is rich in protein. Soak the soya chunks in hot water for 5 -10 minutes.Squeeze the excess water and pat dry. Heat oil in a pan, add fennel seeds and curry leaves.Once splutter add ginger garlic paste and cook for few minutes. Add Onion and cook till translucent. Add soya chunks,chilli powder,salt and cook till soya becomes soft. Add sambar powder, a cup of water and allow it to boil. Add coconut paste and cook for 3-5 minutes.